The leaders of Rwanda and Democratic Republic of Congo have pledged to boost economic and security ties, hailing an "all new era" after a rare meeting. The talks took place 13 years after the neighbours broke diplomatic relations. "It is the first giant step forward," Congo's President Joseph Kabila told reporters after the meeting near Goma. Rwandan President Paul Kagame told his Congolese counterpart that Rwanda would never be a base for militias that could destabilise Congo. They also agreed to develop projects to exploit natural gas reserves in Lake Kivu, which lies between the two countries, and to revive joint commissions that have lain dormant for years. The meeting comes a month after both sides appointed ambassadors to their respective capitals and has been seen as a further sign of improving relations between the countries. In January, the two countries agreed to take joint action against the Hutu FDLR rebels in Congo. Some of the FDLR leaders are accused of taking part in the 1994 Rwandan genocide, before they fled to DR Congo. The Rwandan forces have also arrested Congolese Tutsi rebel leader Laurent Nkunda, who is wanted in Congo, but has so far refused to extradite him over fears he may be executed. 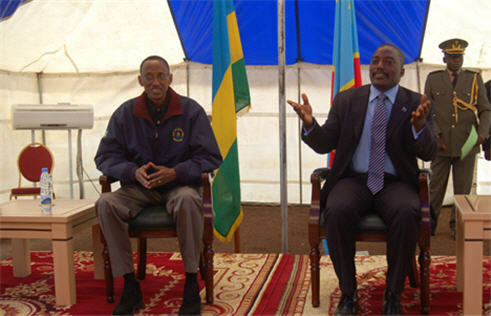 But Mr Kagame sought to allay Congolese fears at the talks. "I can give a very firm assurance that neither Laurent Nkunda nor [his group] the CNDP can base in Rwanda to cause any discomfort... or affect the stability created in DRC or between DRC and Rwanda," he said. The two leaders are due to meet again in Kinshasa in October or November.